Getting a decent drink during Prohibition was hard for everyone—but it was especially difficult for the poor. While wealthier citizens were off quaffing imported liquor from Canada in opulent speakeasies, or sipping wine from their own private cellars, poor working stiffs had to content themselves with a drink from a very different kind of place. Smoke (Hell’s Kitchen, New York City, NY): For 10 cents a slug, you could drink a mix of raw alcohol and water—or possibly jellied cooking alcohol squeezed through a rag. Yak Yak Burbon (Chicago, IL): A mix of whatever crap is lying around plus a shot of iodine—they sure weren’t lying about the name! Soda Pop Moon (Philadelphia, PA): Shelled out in soda pop bottles, its main ingredient was rubbing alcohol. Sweet Whiskey (Kansas City, MO): Made with distilled alcohol combined with nitric and sulfuric acid that could destroy your kidneys, this “whiskey” was anything but sweet. White Mule (the South): These fruit jars full of clear, straight ethanol took a special trick to drink: keep the jar closed until you were ready, then take a deep breath, open the lid, guzzle it down, and slam the lid back on before it could evaporate.4 Often mixed with ginger ale or grape juice to help it hold together, but it didn’t do much to mask the awful taste…or the feeling of being kicked in the head by a mule after you drank it. Jackass Brandy (the South): Supposedly made from peaches and sold at $4 a quart, this brandy packs about as much as it’s sibling, White Mule. The peaches didn’t do much to change the fact that it caused internal bleeding and severe intestinal pain, however. Goat Whiskey (Indiana/South Dakota): Another popular “secret” recipe, this “whiskey” was rumored to contain some portion of its namesake. Jamaica Jake / Jamaica Ginger (South): So prevalent and nasty it’s worth an entire post all by itself, this potent beverage—90% alcohol and 180% proof!—often left its imbibers with permanent neurological damage in the form of paralysis. 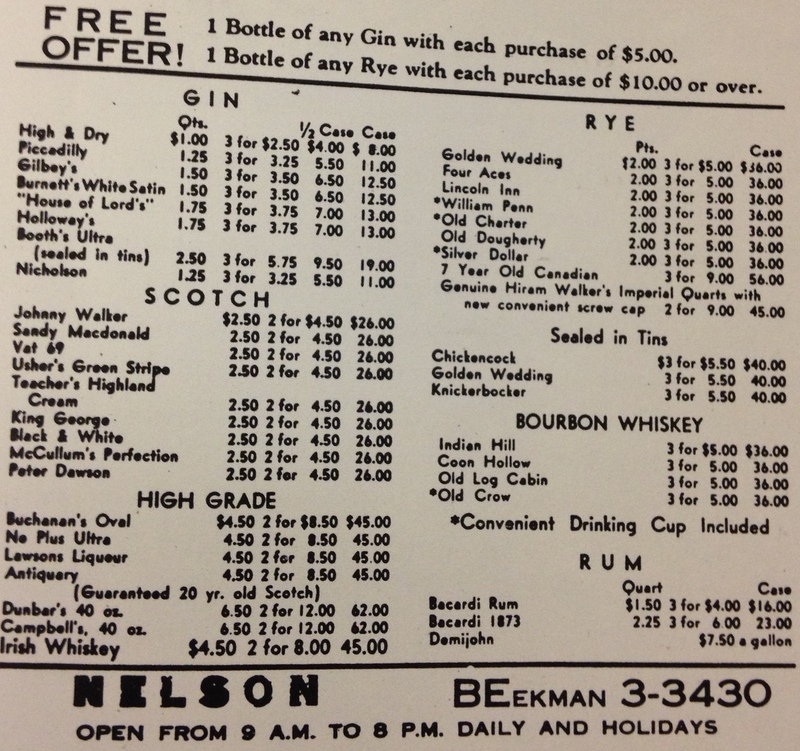 See the “Old Crow” listed on this New York shop sign? Also known as “Old Corrosive,” it was another popular form of awful bootleg hooch. While each of these drinks boast truly awful ingredients, there is one deadly additive not listed here that almost every bootleg drink in America shared throughout the Twenties: a nice, healthy dose of wood alcohol. 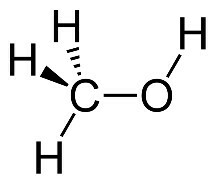 The chemical structure of wood alcohol. And to make matters worse, you couldn’t even tell if you drank it! According to Alexander Gettler, the United State’s first forensic chemist, wood alcohol had a deadly allure for the drinker and the unscrupulous bootlegger alike: it “tastes [just] like ethyl [grain] alcohol and…is considerably cheaper” for both parties involved.14 Bootleggers could easily slip it into their products for an extra “zing” that didn’t cost much, while poor drinkers could get themselves something approximating booze for just “a few cents a glass.”15 Everybody wins, right? 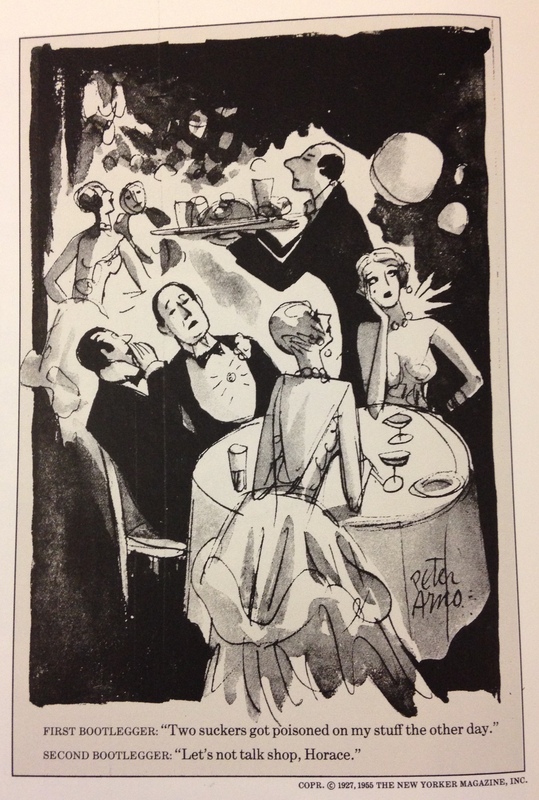 FIRST BOOTLEGGER: “Two suckers got poisoned on my stuff the other day.” SECOND BOOTLEGGER: “Let’s not talk shop, Horace.” New Yorker cartoon, circa 1927. Death wasn’t always so immediate, however. Because the deadlier compounds in methanol—the formic acid and the formaldehyde—didn’t come out until the drink was fully processed by the liver, death could “take up to five days, meaning that the…drinker c[ould] stew in an increasingly lethal cocktail for the better part of a week” before finally dying.19 Early symptoms mimicked inebriation, too, so a person could be admitted to a hospital, get shoved in a corner bed and told to “sleep it off,” only to die a few hours later. 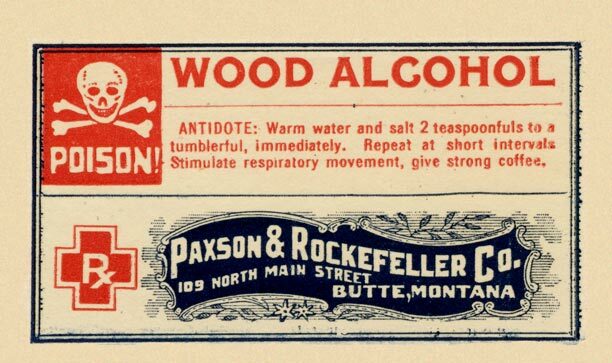 The death toll got so high that doctors, newspapers, and organizations started publicly warning people about the dangers of wood alcohol and encouraged the government to limit its sale. But the deaths didn’t stop there. Taking a gamble on your life, it seems, was all part of the fun of Prohibition. People expected a fair amount of their illegal booze to contain something “special,” especially if they weren’t able to afford the real deal. When Charles Norris, New York’s first medical examiner, had his staff analyze bottles and hip flasks collected at various speakeasies around the city, they found that not only did every single drink contain wood alcohol, but also traces of “gasoline, benzene, cadmium, iodine, zinc, mercury salts, nicotine, ether, formaldehyde, chloroform, camphor, carbolic acid, quinine, and acetone.”20 You’d sit there with your friend while a server brought you mysterious, off-color drinks, and you’d knock them back one after another no matter what they looked like, so long as they got you good and lit. After a night of hard drinking, “you[‘d] ring up your friend the next morning to find out whether he [was] still alive.”21 People knew they were drinking bad alcohol, but they didn’t seem to care. Instead, they rolled the dice with every glass and took their chances. If you think that people were crazy to drink poisoned hooch, then you’d be in agreement with the United States government at the time. It took a similar stance as Wayne Wheeler, the general counsel of the Anti-Saloon League of America, who declared that those who violated the Volstead and drank bootleg liquor were “in the same category as the man who walks into a drug store, buys a bottle of carbolic acid with a label on it marked ‘poisonous’ and drinks the contents.”22 According to Wheeler, anyone stupid enough to drink poisoned stuff—which was illegal to begin with—must suffer the consequences of their actions…and if that led to their deaths, then so be it. The United States government agreed. In fact, they hastened people’s deaths in 1927 by increasing the amount of poisonous ingredients in denatured industrial alcohol, the source that most bootleggers turned to in order to distill their own products. None of this stopped Prohibition drinkers, however, from taking their chances at illegal booze—and sometimes paying for it with their lives. Drinking in the United States wouldn’t become truly safe again until the Volstead was repealed in 1933 and industry regulations were put back in place. Thirsty for More? Try Deborah Blum’s excellent Slate article on how the government actively poisoned the American people during Prohibition. Her nonfiction work The Poisoner’s Handbook is a terrific read! 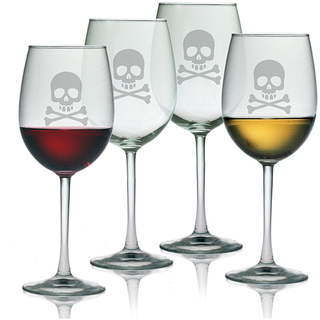 Skull wine glasses taken from Overstock—you can buy them here! This entry was posted in bootlegging and tagged alcohol poisoning, alcohol poisoning during Prohibition, bootlegging, drinking during Prohibition, methanol, wood alcohol, worst booze. Bookmark the permalink. Thanks so much! I’m glad you liked it. Did any poisoned hooch show up in your novels? I’ll probably write a few more posts like this, since it’s a pretty big topic. However, if you liked this I would heartily recommend Deborah Blum’s book “the poisoner’s handbook.” It’s excellent and covers all kinds of popular poisons in the 1920s, while also showcasing the birth of criminal forensics. It’s fascinating! I’ll read your article on this topic vith great interst.